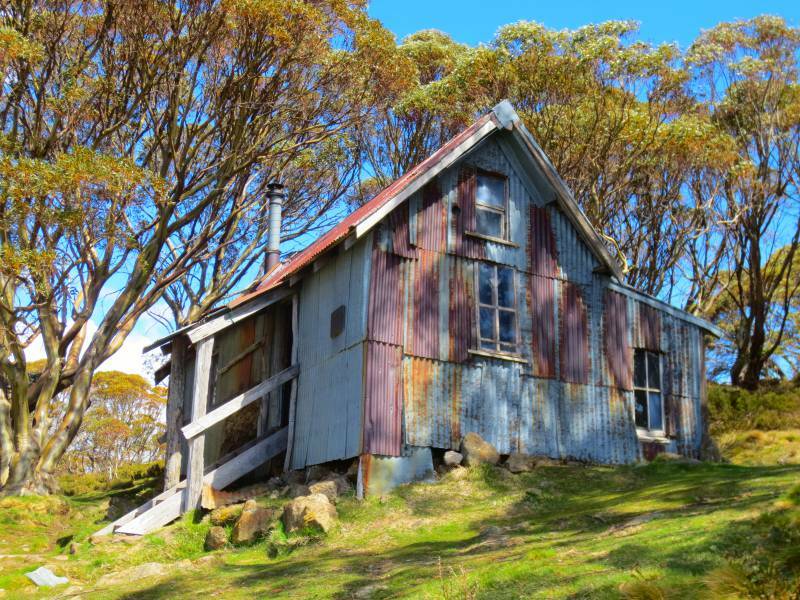 Scattered throughout the Australian Alps are more than a hundred historic huts. They date back as far as the 1860s. 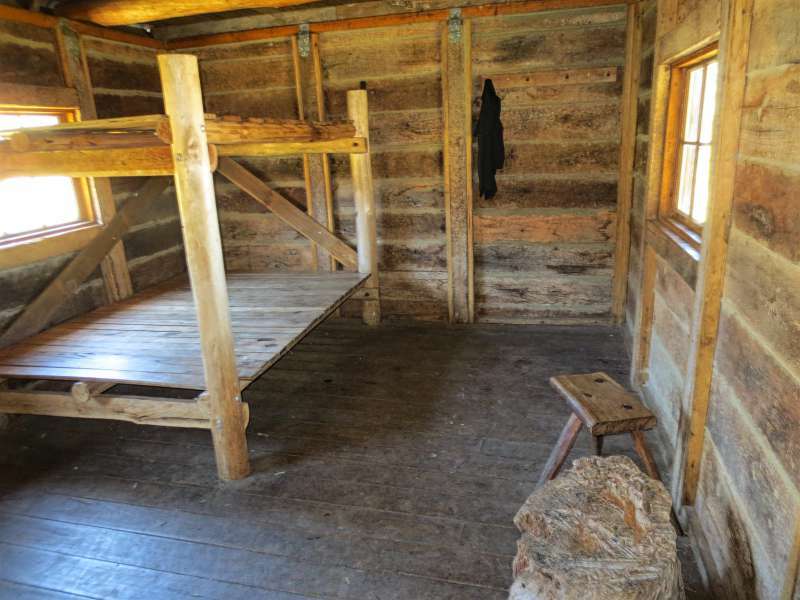 Many were built as shelters by stockmen grazing their cattle on high country pastures. Others housed fishermen, gold prospectors, foresters, workers on the Snowy Mountains Hydro-Electric Scheme, skiers and bushwalkers. Today they are used as emergency shelters for skiers and bushwalkers caught out in the changeable mountain weather. The huts are the antithesis of luxury. 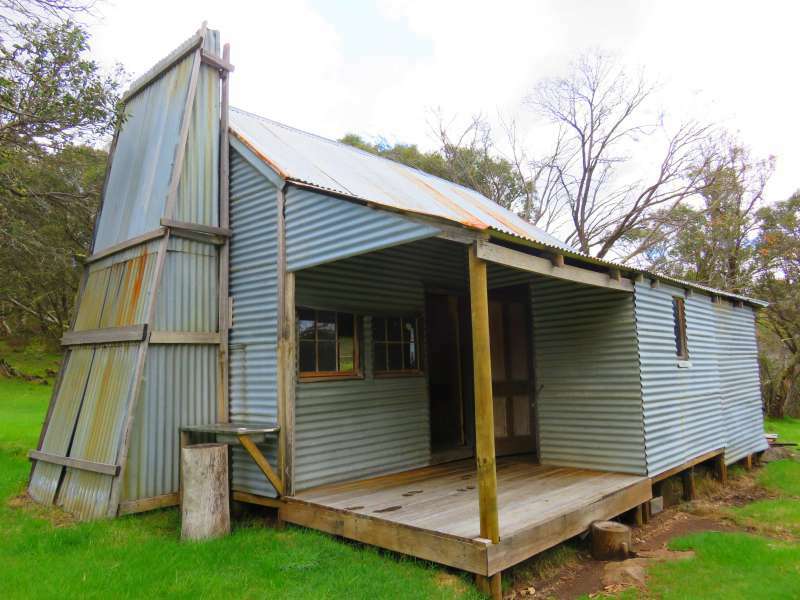 Most are simple corrugated iron or wood constructions. Very few are easy to get to. They are tucked away in the back country, far from roads and other services. Over many years of skiing, bushwalking and mountain biking David and I have come across a half dozen or so of these huts. With a few exceptions they are a challenge to find and it is always fun when we come across one. 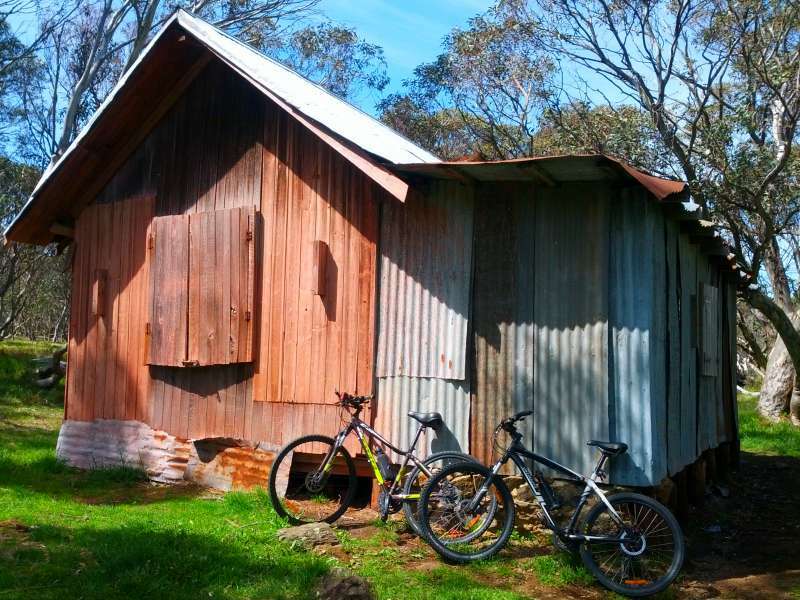 We have never camped out overnight so all the huts in this post can be reached in a day's bushwalk or mountain bike ride from the nearest road. Cope Hut was built in 1929 by the Ski Club of Victoria. In summer it is one of the most accessible huts in the mountains. When the Bogong High Plains Rd beyond Falls Creek is open you can park at the Bogong chalet car park and find Cope Hut 500 metres along the track. When the road is closed but clear enough of snow to cycle on, park at the Rocky Valley Dam Wall and bike or hike about 9kms to the turn off to the hut. Note: The Bogon High Plains Rd is closed in winter and early spring. When it opens each year varies according to when the last of the snow melts. 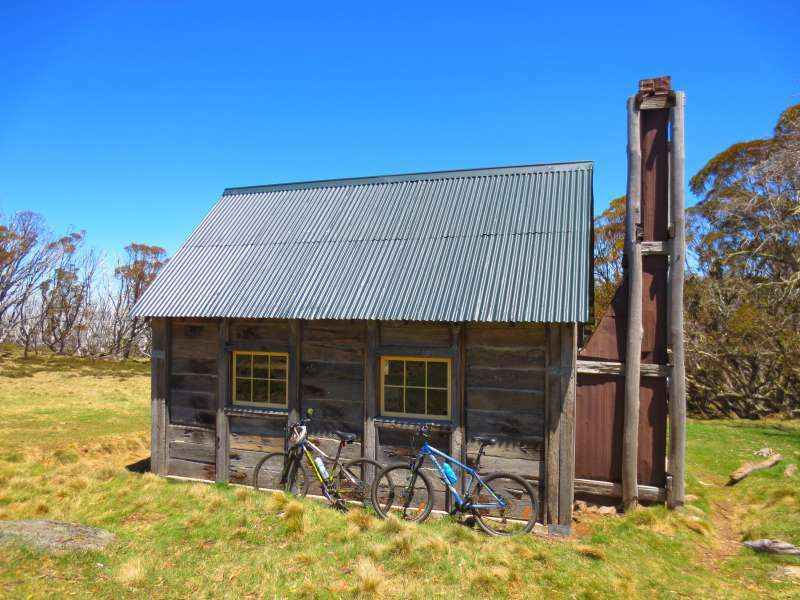 Wallace's Hut is the oldest hut in the Alpine National Park, Victoria. It was built in 1889 by three brothers - Arthur, William and Stewart Wallace. 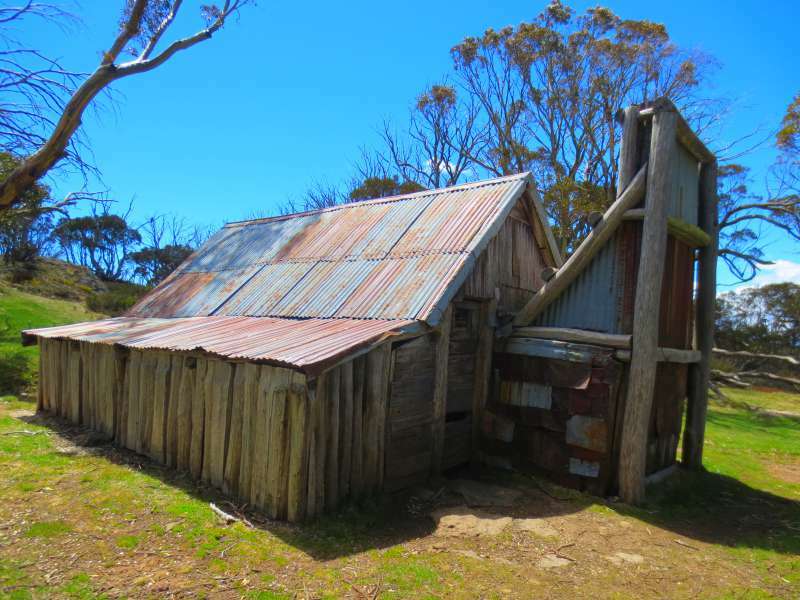 Wallace's Hut was used as a shelter for stockmen pasturing their cattle in the High Country. It is on Wallaces Track about 750 metres in from the Bogong High Plains road. Wallace's Hut is a great place for a picnic. It is in a lovely clearing and someone has thoughtfully provided a wooden picnic table and bench set nearby. Positively modern compared to many of the other High Country huts Faithful Hut was built in 1962. The Faithful family mustered brumbies (wild horses) and pastured cattle in the High Plains. The original Fitzgerald Hut was built in 1903 by George Silas Fitzgerald. 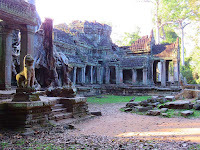 Destroyed by fire in 1991 it was rebuilt using salvaged and recycled timber. Nestled in a large clearing, three to four hours hike from the Bogong High Plains Road, it is a great place to stop for lunch or to camp overnight. Even on a clear day the hut is not easy to find. I would hate to be looking for it in a blizzard. The best way to approach it by mountain bike is along the Langfords East Aqueduct Trail, then follow the signs. 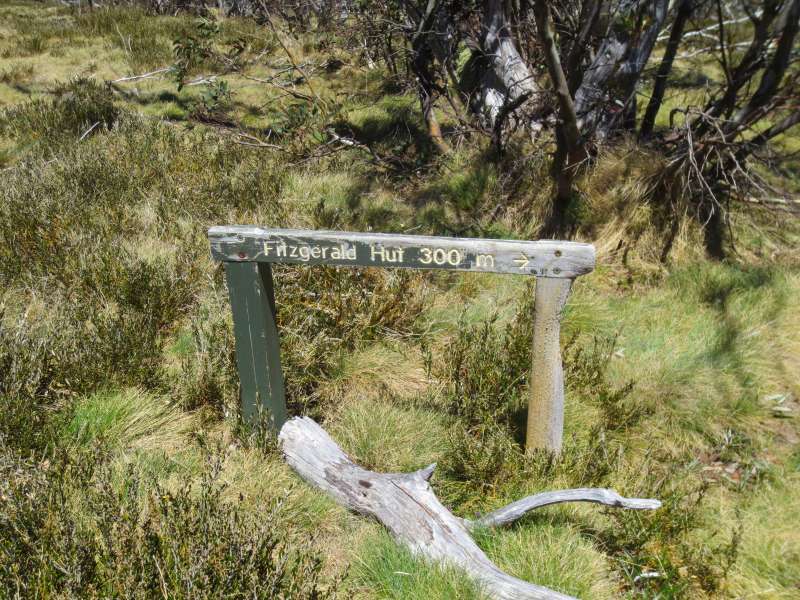 When you come to the sign which says 'Fitzgerald Hut 300 m' you have about twice that distance to go. Inside Fitzgerald Hut - There was a large fireplace in the corner out of shot of the camera. The 300 m distance is not accurate. The first hut here was built by Kyran Marum and Jack Platt in 1901. The second by Patrick J Kelly also in 1901. In 1956 the hut was burnt down and replaced with a State Electricity Commission (SEC) hut moved from a nearby site. The SEC hut was probably originally built in about 1928. Kelly Hut is even more difficult to find than Fitzgerald. We have stumbled across it twice now but both times the location of the hut did not accord with where we thought we were according to our topographic maps. JB Plain Hut is a relative newcomer. It was built in 1978 as a Forests Commission hut, although there was an earlier hut nearby built in 1934 by the Omeo Ski Club. The early hut was demolished in 1989. 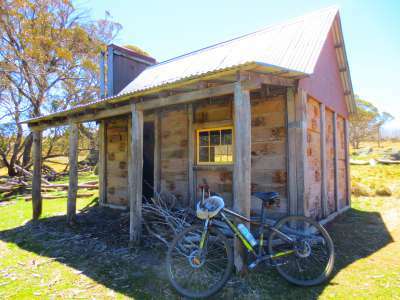 The hut is only a few hundred metres from the Great Alpine Road at JB Plain, west of Dinner Plain. David and I came across it while cycling the Dinner Plain to Hotham Trail. You can read my blog post on the cycle here. Like JB Plain Hut, Wire Plain Hut is easy to reach, being only a few hundred metres from the Great Alpine Road, east of Mt Hotham. It was built by Bill Howard in 1962 as a cattleman's hut and is still used today by cattlemen. Wire Plain Hut. It is hard to believe looking at this photo but Wire Plain Hut has a carpeted living area. Geehi is the only hut I am aware of that you can drive right up to in a two-wheeled drive car. Take the Alpine Way west of Thredbo toward Khancoban and turn toward Geehi Flats Campground about 47 kms along. The road is closed in winter and early spring. Geehi was built in 1952 by the Nankervis brothers as a fishing and grazing shelter. In the late afternoons there are always large numbers of kangaroos grazing nearby - you can't miss them. Although David and I have walked and cycled past it many times I don't have a photo of Seaman's Hut, at least one I can find, but I couldn't finish this post without mentioning it. Seaman's Hut is beside the Summit Road leading to Mt Kosciusko, about two-thirds of the way along from Charlotte's Pass. It was built in 1929. Laurie Seaman and Evan Hayes perished in a blizzard on 14 August 1928 after skiing to the summit of Mt Kosciusko. They were Australia's first recorded skiing deaths. Laurie Seaman's body was found very close to where the hut is now. Construction of the hut was financed by his American parents as a memorial to their son and to prevent others suffering the same tragedy. The hut has saved countless lives in the ensuing years. 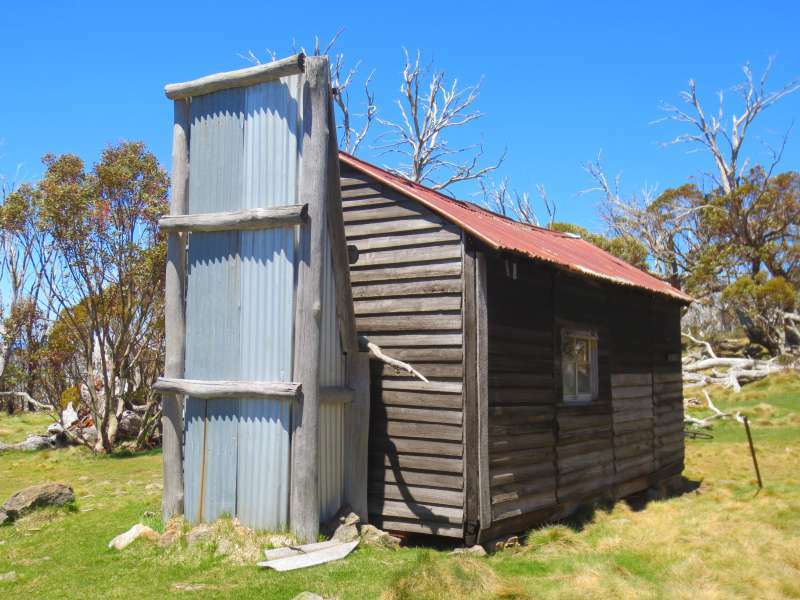 More information about Australia's high country huts can be found at the websites of the Kosciusko Huts Association and the Victoria High Country Huts Association. I like the different histories of these huts. New Zealand has high mountain huts too (they are mostly administered by the Dept of Conservation for trampers/hikers). I didn't know that New Zealand had them. I must go looking for some of them one day. Most of the huts are for emergency use only but they are left open (obviously) and people often camp nearby them. Geehi is the most substantial hut we have come across with the exception of the Rover Chalet near Falls Creek. I didn't include it because it is more of a cross country ski chalet than a hut but it too is fun to find. These old tin huts are so full of character! Thanks for linking up with #wkendtravelinspiration, see you next week! Next week the Travelling Lindfields will come to you from the Land of the Long White Cloud. They make wonderful photos. I would hate to have to stay in one overnight though - they are very basic. Thank you. Last time we discovered a few of the huts I went out and more topographic maps with the intention of hunting down a few more. It is on my list for this year or next. What a hospitable gesture to make these huts available for travelers in the back country to use when shelter or a resting place is needed. I imagine it was fun looking for and finding them. Great photos! The huts have saved many lives over the years. All of your photos were great, Lyn and I imagine that finding the huts on various hikes and biking trips were big "Yes!" moments as well as reading up on their backstories. I especially loved your first photo of the Cope Hut with its fading blue paint and variegated rust tones and the Geehi "hut" definitely was a class above the others. A fascinating post! My favourite is also Cope Hut, because of its lovely colours, although Wallace's Hut is in a nice spot for a picnic. Thx so much for introducing us to the huts of the High Country! Looks like a very fun journey. We have gone back many times. I have a list of huts I still want to seek out. Wow those don't look like they have wifi XD just kidding. But they are certainly impressive to take photos of. Not only no wifi but no mobile phone reception. David and I always let one of our adult sons know where we are headed when we cycle the High Country and when we expect to be back. They are under instructions to check first with the hotel we are staying at and then call the police if we don't ring or sms to say we have returned safely. They are both twenty-somethings so I don't ever want to find out how reliable this system is. The huts do make lovely photos though. I think I have read your article on Heidi's Hut already but I am going to check it out again now. Thanks. How interesting! I love the history and character of the huts. I had no idea these existed, though it makes perfect sense. Thanks for sharing! Very few people know about them. We only do because we kept stumbling across them while out cycling the high country. 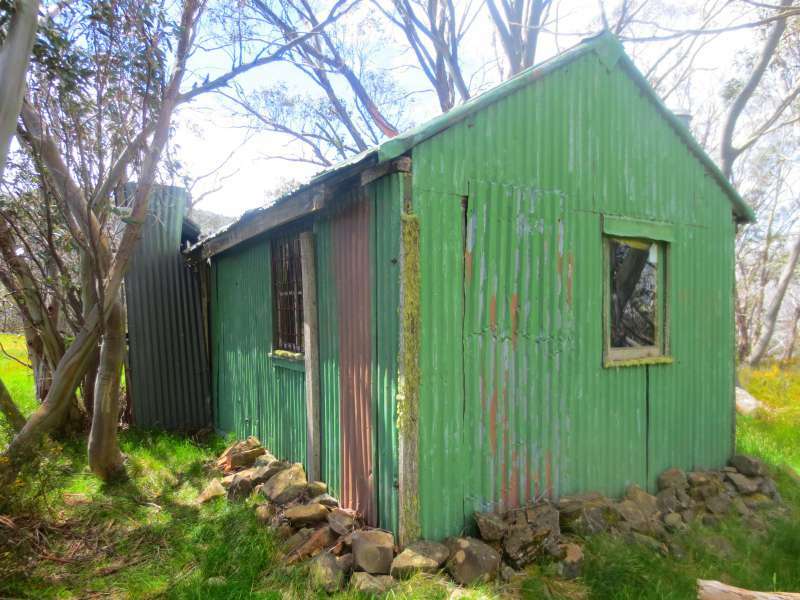 So interesting to read about the Huts of the High Country in the Australian Alps. What a great adventure to consider taking - searching for the huts of the high country. Thanks for sharing this. I have a lot more huts on my list. They are marked on topographic maps but not all are as easily accessible as the ones we have found so far. You are right. The structures are fireplaces. I imagine that a roaring fire would make a huge difference to anyone caught out in a blizzard. The stone one I have a photograph of is Geehi Hut. It is the easiest to get to (in summer) and always has large mobs of kangaroos around it. Seaman's Hut is also stone but I don't have a photo of it. Love these huts! Some enterprising tour/hiking company should start doing hut tours. Love the remoteness of these and the ingenuity of their design. Great post! What a great idea. As far as I know, no-one does tours to the huts, although a lot of school groups hike to them and camp near them. Those huts look so interesting. I love it when you come across a bit of history when you're out hiking. Absolutely - or driving, or cycling or just wandering about. I didn't learn a lot of history in school. I don't think I was interested enough in it, but I love it now. Especially when you find bits of it in context. I wish I could visit them all but without camping I don't think that would be possible. I want to visit as many as I can though.